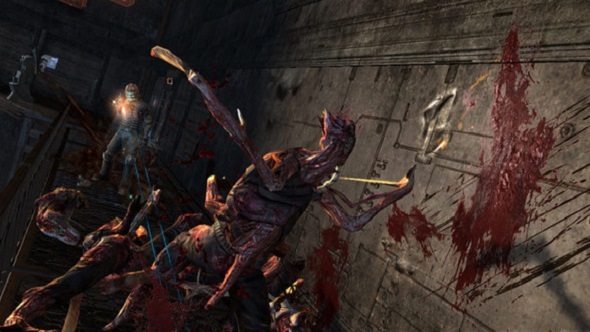 Dead Space released into a world of players trained to aim for the head. 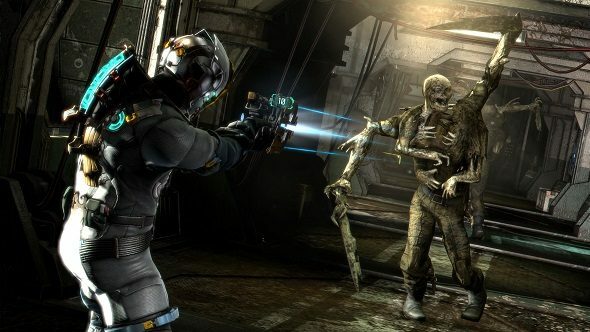 That tiny hitbox at the top of every character model is the sweet spot for causing critical damage in a shooter, but Visceral’s third-person horror game instead told us to go for the extremities, to lop off limbs, to tear its alien abominations to pieces and crush their corpses underfoot with magnetised boots. Like reading about in-game combat? Here’s how the inky alien splats and gooey guns of Prey were developed. Most shooters are about killing as quickly as possible. While that is, ultimately, still your goal in Dead Space, this horror game forces you into a longer struggle with your foes. As armoured engineer Isaac, you find yourself on an abandoned ship filled with alien lifeforms known as Necromorphs. These creatures are relentless. They keep coming, spilling from vents and climbing up walkways, while the enclosed corridors of the USG Ishimura means there is no escape. The only way to put them down is to use engineering tools such as the Plasma Cutter to fire a searing beam of energy at their limbs, severing as many as it takes to put each mutant down. Making this fraught, time-sensitive virtual surgery work visually was easier than you may expect. When your shot lands on a Necromorph, the limb behind the ensuing weapon effect is hidden from your view. At the same time, a new limb is generated, which then falls to the floor. In fact, some of the limbs that are generated are entire ragdoll enemy models, albeit with everything but the limb itself hidden from view. That visual trickery is invisible to you, much like the little tells that nudge you to get into the Dead Space mindset. At their core, every enemy is programmed to come straight at you and tear into your flesh. They will pursue you doggedly, but there is more going on under the skin – you just need to make a little incision and peel that rotting flap back to see. 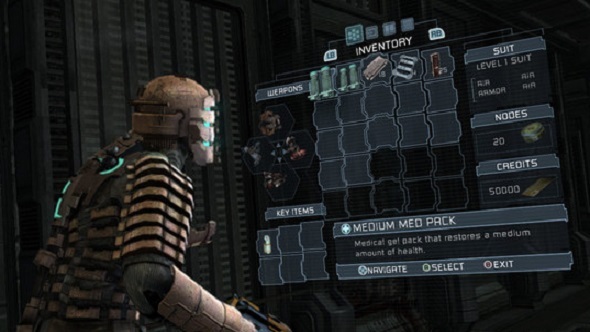 Though Dead Space’s arsenal is created entirely from sci-fi engineering tools, each weapon feels powerful and each shot feels meaningful, thanks to chunky, animated visual design, huge, identifiable silhouettes for each tool, that limb-lopping enemy feedback, and limited ammo. Miss a shot here and it can be your undoing, meaning you need to be methodical, even when amid chaos. Ridley Scott’s Alien is a scarier film than its sequel because it is about a deadly threat stalking the humans through a claustrophobic environment. Likewise, Visceral made sure the USG Ishimura was full of tight corridors, dark corners, malfunctioning doors, flickering lights, and terrifying alien creatures, all adding up to make you feel constantly on edge. It is not just to ramp up the tension, however – this combat is built for those corridors. 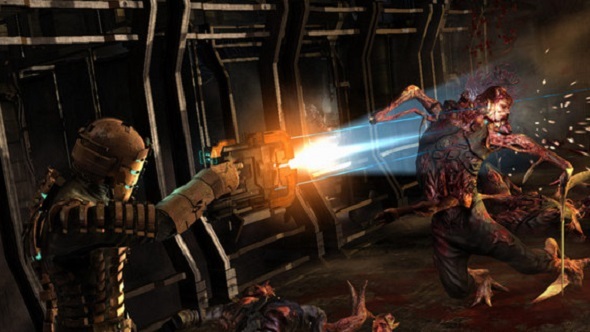 As always, game development is about knowing when to kill your babies – and, no, I’m not talking about that horrific nursery section in Dead Space 2. If a feature doesn’t suit your game then you throw it out. A similar ethos led to the creation of Dead Space’s stripped-back HUD. Milham grabbed a clip of horror flick The Texas Chain Saw Massacre, overlaid a HUD on the action, then took it into work to show everyone how less scary it made the movie. Stripping back that HUD really allowed you to appreciate every severed limb, every chunky weapon animation, and every malfunctioning light. 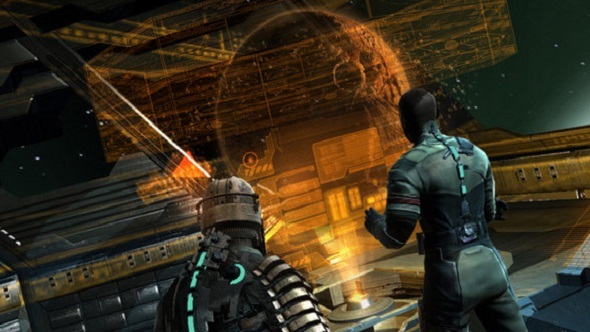 It all works together to make Dead Space feel unlike anything else. In a world where we are all still aiming for the head, it will be missed, along with the talented team at Visceral.